Minas Tirith Forums: Long-haired Legolas? This is a sticking-point which always bothered me, since it (once again) shows how naive that PJ is about combat-- in this case archery; in reality, no archer would have long hair flopping around like that-- particularly one who used bow in combat-- since it could get in the way of in the bowstring. In fact the only Elves mentioned as having long hair, were those who didn't use bows, such as Elrond, Celeborn, Glorfindel (and naturally Galadriel). While some could argue that Legolas could have blonde hair, there's absolutely no excuse for him having long stringy tresses down to his arse. Fingon, who we have seen use a bow (he's about to shoot Maedhros with one when the eagles come) has long hair. Of course, it does say that he wore it in plaits, not loose - but it was still long. "Being seen to use a bow" doesn't make him a bowman; he was high king of the Noldor, , and commanded the Battle of Unnumbered Tears. Elrond and Celeborn most likely used a bow as well at some time. Also he wore his hair in plaits braided with gold, which would weight his hair down, and he most probably wore a helm in battle as well. Legolas meanwhile was a wood-elf and wore neither helm nor armor, nor was there any mention of plaits, gold, or long hair. and commanded the Battle of Unnumbered Tears. Along with Maedhros, yes. But what does this have to do with anything? And you're right that he probably wore a helm, etc. I was just making the point that Legolas isn't the only elf out there who has long hair and fights. Show where he used a bow while havin long stringy hair-- NOT while omitting 99 material factors of difference. The comparison just isn't there between high king of the Noldor with his hair in plaits wound with gold, who allegedly wielded a bow at some time, and a lone Elf-bowman with stringy hair flopping and blowing around way past the bowstring (as silly as his rapid-fire style, but no sillier than the rest of the stunts he pulled). Is this even worth arguing? You can shoot a bow easily with long hair. All you have to do is tie it back. And in the movies his hair is always braided and neatly combed back over his head. The 'long stringy tresses' that occasionally hang off the sides of his head to his shoulders are depicted as strands of fine, straight hair that is not going to get caught from brushing up against a yew string. I think long hair is also a trait of nobility, especially since many royal Noldor and Wise have long hair. Legolas was a prince, therefore he probably also wore his hair long. The third was taller than the others; his hair was long and gleaming and on his helm was a crown. 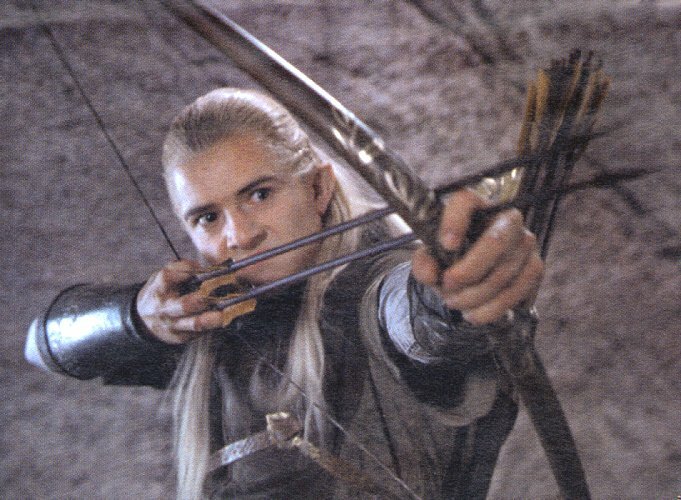 Also, the mastery and precision of Legolas, whom has probably been practicing with a bow for centuries (as most elves train often in the arts of war in their lives), he probably has no interference at all from his hair; every shot is skillful and free of the possibility of human error. To Legolas she gave a bow such as the Galadhrim used, longer and stouter than the bows of Mirkwood, and strung with a string of Elf hair. there's absolutely no excuse for him having long stringy tresses down to his arse. There's yer excuses. I wonder what other negligible, minuscule, and not specified by Tolkien thing we can find that PJ interpreted so carelessly, so we can correct him and expose how REAL Tolkien elf-prince archers wear their hair. "It is told that when the hosts of the Eldalië departed from Cuiviénen Oromë rode at their head upon Nahar, his white horse shod with gold..."
All you have to do is tie it back. And in the movies his hair is always braided and neatly combed back over his head. The 'long stringy tresses' that occasionally hang off the sides of his head to his shoulders are depicted as strands of fine, straight hair that is not going to get caught from brushing up against a yew string. They will get in the way of his GRABBING the string-- not much fun to grab a bowstring and wind up with a handfull of your own hair along with it. He wasn't described as such, though all the long-haired characters were. He was also a Sylvan elf by lifetstyle, and they'd keep theirhair short. Yes, and he didn't use a bow, except when he was mounted on a fell beast-- also helms tend to hold hair down from flopping and flying around. Yes, because he CUT IT SHORT! Even Amazon women were said to slash their right breast off because it interfered with the bowstring. Or maybe he got it from a FEMALE elf? ELves didn't routinely go re-stringing their own bows from their own hair in the field; it would be more convenient to carry a spare made from the wife's lovely locks ahead of time, considering that making of bowstrings is an art and a craft in and of itself. Yes, female elves have hair too you know, and they don't often wield bows. If you're feeling suicidal regarding a battle of facts, I also know about archery personally and professionally. Tolkien was quite clear by context that Legolas didn't have long hair, and probably not blonde either-- and definitel not horse-faced and constantly sneering. Tolkien depicted Beleg with (what I would call, and what Hammond & Scull do call) long hair, after he had introduced the great bow of Beleg to the legend, and Túrin's song 'The Bowman's Friendship', in the Lays. *Edit: I find it even more amusing that Orlando Bloom isn't holding the bow right in a SINGLE PICTURE above-- probably to keep his goddam HAIR out of the way (or to mug for the camera). Reminds me of most of the sad fight-choreography, like Liv Tyler holding the sword with her thumb etc. You don't need "long stringy tresses down to your arse" to run the risk of getting it caught in the bow string, since the nocked arrow's anchor point is the cheek, jaw, or ear--easily within range of hair significantly shorter than down-to-your-arse. If Legolas's issue really was long hair getting in the way, he'd have to keep his close crop regularly monitored for just about any signs of growth! There doesn't seem to be any indication of that in the text, especially during their long travels in the wilds: "Hey Gimli, can you take a little off the sides and back for me, please?" It's more likely, if we're going to pretend these guys have actual physics, that he would have kept his hair tied back or restrained under a hood, etc. And no, the movie Legolas's "do" would not qualify as being tied back, sorry. The wind can grab at that mess quickly, "superior" elf skill or not (because I doubt he can will his hair not to fly about in the wind) and yank it right off on release. I've pulled out clumps of my own hair that way, trying to be cool with my hair poetically blowing in the breeze. Still, I don't think these guys should be judged as if they comply with real physics, which is probably the main reason I have a hard time getting too involved in many lit discussions that argue real-world laws. 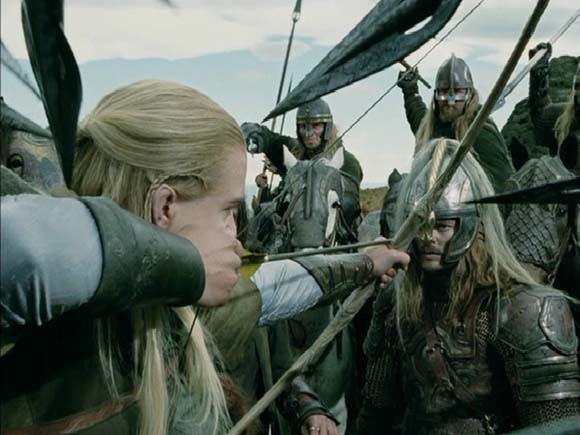 Tolkien's characters do whatever he wants them to do, and if he wanted Legolas to walk about with his bow strung 24/7 for months on end, or alternately, to string it only as he needed it--neither plausible or realistic scenarios--then Legolas did so. If he likewise wanted him to fire his bow with long hair, or alternately with short hair that never needed a once-over with the clippers, then he could do that too. It's probably impossible to judge what length (or color) Legolas's hair might have been, since it's my guess Tolkien did not know, or even care himself. Literary characters, especially archetypal ones, are cool that way, in that they can conform to whatever laws they need, to get the more important messages they were created for across. You don't need "long stringy tresses down to your arse" to run the risk of getting it caught in the bow string, since the nocked arrow's anchor point is the cheek, jaw, or ear--easily within range of hair significantly shorter than down-to-your-arse. And so since he DID have that, then it was WORSE, no? If Legolas's issue really was long hair getting in the way, he'd have to keep his close crop regularly monitored for just about any signs of growth! There doesn't seem to be any indication of that in the text, especially during their long travels in the wilds: "Hey Gimli, can you take a little off the sides and back for me, please?" WHAT? You just said "The wind can grab at that mess quickly, "superior" elf skill or not (because I doubt he can will his hair not to fly about in the wind) and yank it right off on release." They laws have to be CONSISTENT... and it wouldn't hurt you to try the same. Tho' the angled bow does give him a gansta' look don't 'cha think? Maybe, but you are implicitly arguing that it has to be down to his arse before it causes a problem. I'm just pointing out that it doesn't necessarily. Capiche? I'm arguing from several premises--try to think more dimensionally. 1) realistically, neither long nor short hair works that well. 2) "if we're going to pretend these guys have real physics. . ."
2) sorry, nope, I just can't buy that they do. Need it again? I can go more slowly. *Laff* Agree. What's with that retarded angle straight out of bad archery for dummies? You hold it upright, or if it's a longbow and you are near to the ground, you hold it horizontally. Orly wants to do it all at once, because if one way is cool he must believe, then both ways must be cooler. Get this man some proper help please. You'll have to find a copy of Tolkien's illustration Beleg Finds Gwindor (Flinding) in Taur-nu(na)-Fuin. It's reproduced in H&S's book for example, where it is sufficiently 'long' to earn that description there, in any case. And, although I am certainly not defending Jackson, I would disagree that Tolkien was 'clear by context' that Legolas did not have long hair (though how long is 'long' is another matter). In my opinion the main force of the argument (as far as it goes) of color rests on the issue of the relative rarity of golden hair in Middle-earth among the Eldar -- leading to arguable notability. And to my mind even this stance does not make it clear in any case. I don't remember anything about the relative rarity of a certain hair length (for Elves) in the legends however. I was obviously exaggerating-- it's only down to his moobs! Preposterous-- short hair works fine. It's where you NOCK the arrow that counts, not where you draw it. Doesn't seem like it; there were no other-worldly physics applied in Elven-archery. As for his bow being strung for years, even though it's not mentioned that they strung them or didn't, there's nothing unworldly about that--many types of bows have that capability, and who says Elves couldn't develop something similar with their amazing craftsmanship? He's a disgrace to his heritage; must be a Norman? And check out how in every pic, he's either about to lose his hair OR his nose. That's like taking up paleontology (or bowling) after watching Fred Flintstone. Actually as the one making the statement, that would be YOUR job. And, although I am certainly not defending Jackson, I would disagree that Tolkien was 'clear by context' that Legolas did not have long hair (though how long is 'long' is another matter). Long enough to get in the way of the bowstring-- I believe I mentioned that... in the outset of this thread. In my opinion the main force of the argument (as far as it goes) of color rests on the issue of the relative rarity of golden hair in Middle-earth among the Eldar -- leading to arguable notability. And to my mind even this stance does not make it clear in any case. So different hair-color gets caught in the bowstring differently? Interesting.... please explain. Believe it or not, the Professor may have had an idea about this basic topic at one point. The letter comes from very close to the end of his life, but he may have considered it earlier. [Galadriel] was [in her youth] of Amazon disposition and bound up her hair as a crown when taking part in athletic feats. So basically I would guess that he did realize that long hair can get into the way during physical activities. The other option would be that Galadriel did this simply for asthetics. Edit: found an image, currently in Were there barbers in ME? (in The Hobbit forum) here at MT. And yes I know it's early in date and need not represent Tolkien's later idea of Beleg in all details; but the point is, though early it was made after the Lay and etc. (as I said above), and thus is at least an example of Beleg 'the Bowman' with long hair as depicted by Tolkien himself. This just points out the obvious fact that 'long' can still be somewhat vague. Even if Legolas was said to have had long hair in the books Readers still wouldn't know how long it was -- the statement went no further than that. In my opinion the main force of the argument (as far as it goes) of color rests on the issue of the relative rarity of golden hair in Middle-earth among the Eldar -- leading to arguable notability. And to my mind even this stance does not make it clear in any case. I don't remember anything about the relative rarity of a certain hair length (for Elves) in the legends however. That's not my argument of course. You seemed to be trying to build a similar approach here to the one regarding hair color -- that since golden hair is relatively rare in the Eldar of Middle-earth, and Legolas, being of Eldarin heritage and also 'not described' as far as hair color -- then 'probably' he has dark hair. However in my opinion you have presented no compelling basis to say that the length of Legolas' hair, by simply not being described in the books, makes it more likely that his hair is short. To my mind Legolas' hair length being unknown in the books in no way makes it 'clear by context' that he has short hair. And if you want to make the argument that it should be short because he often uses a bow -- that's a different argument in any case. As for his bow being strung for years, even though it's not mentioned that they strung them or didn't, there's nothing unworldly about that--many types of bows have that capability. . . . The only bow of I know that can handle being strung for extended periods of time is the modern compound bow (and even then it causes unneeded stress on it). Wooden recurve or long bows must be unstrung, as the stress on both the wood of the bow and resiliency of the string can have some pretty detrimental effects on them. However, this is real world physics, which provides only limited support for arguing about literature, and fantasy literature especially. One can say Legolas's bow was of enchanted wood or strung with magical elf hair which never loses its resiliency. But then that throws out all the other arguments that stem from actual physics, such as real bows do exist that can remain strung, or Legolas had blond hair because of such and such genetics. It's ultimately what Tolkien needs Legolas's bow (and hair) to do that takes precedence over anything else. This is why I keep returning to my third argument. . . .and who says Elves couldn't develop something similar with their amazing craftsmanship? Exactly. That's what I'm saying about Tolkien inventing his own rules to further his purpose. Maybe the elves did have some unknown technology (or magic) that allowed for persistently strung bows. Even though this technology doesn't fully exist for us, it can exist for him if he likes, and as a result, I find I really have a hard time discussing literature without deconstructing everything I say in my own wake and ultimately being a real killjoy in what might a fun and interesting discussion. Sorry. Ouch, the professor's rolling over in the likelihood. There's a mention that PJ saw Orly in a play and decided he immediately wanted him for his LotR (now with action kung fu grip!) films--while he seems horribly cast as Legolas to me. Yuck. But it got me to thinking what actor might have been a good choice for Legolas. Sure, Sean Connery might have made a great or not so great Gandalf, but casting Legolas would have had its own problems--mainly finding someone fair (and graceful) enough to play him convincingly. He also seems to have had an ethereal serenity that was so above everyone at times, and a playful sense of humor when the notion took him. Undoubtedly he is one of Tolkien's most subtle characters, as many readers don't "get" him and view him as featureless, when he was anything but! I'm actually curious to hear other opinions on who might have done Leggsies justice. There's a mention that PJ saw Orly in a play and decided he immediately wanted him for his LotR (now with action kung fu grip!) films--while he seems horribly cast as Legolas to me. He didn't immediately think of him as Legolas, though. Orlando Bloom first auditioned for Faramir, but didn't get the part. EVERYONE was pretty mis-cast-- remember we're dealing with PJ's mental representation of LotR, which is bizarrely different from Tolkien's. So you just can't figure how he could keep his hair short other than by force of will. Which combines argument from ignorance with non sequitur, i.e. you're claiming if a bow of unkonwn make can go for a long time without the string being specifically stated to be loosed, then the only explanation long hair doesn't get caught it is MAGIC-- rather than simply cutting it short. You've obviously missed some things I said above. You must have a hard time trying to keep everyone's argument in counter. Figures some of it would get away from you. Which combines argument from ignorance with non sequitur, i.e. you're claiming if a bow of unkonwn make can go for a long time without the string being specifically stated to be loosed, then long hair can't get caught it. Sure, whatever you say. That's some rock solid argumentation and logic you're using there. No, of course, and I didn't say he did; however that PJ seems to have arbitrarily assigned him to the part of Legolas as an afterthought neither demonstrates to me he was a very strong choice for the role. It's like PJ himself wasn't sure who or what would make a good Legolas and just went with whoever could fit into the tights or whatever. that PJ seems to have arbitrarily assigned him to the part of Legolas as an afterthought neither demonstrates to me he was a very strong choice for the role. It's like PJ himself wasn't sure who or what would make a good Legolas and just went with whoever could fit into the tights or whatever. Or into the white wig? I'm actually curious to hear other opinions on who might have done Leggsies justice. But as for who might have been a better Legolas - that's a difficult question. In my mind, the Eldar need to be beautiful, yes, but in an almost surreal, otherworldly way. And not effiminate, as PJ tried to make them (unless they're female, of course ). I had that problem with PJ's elves - he thought that he could make them 'graceful' by making them effiminate. Not the same thing. One has only to look at men's figure skating, or gymnastics, or diving to know that men can be perfectly graceful while still being powerful and masculine. I see elves as being built rather like figure skaters, actually. Lithe, strong, but not overly 'body-builder' muscular. As to who could play Legolas - not a clue. I don't know that you'd want a 'known' actor to play him. Scott Hamilton has done some film work. So have Elvis Stojko and Brian Boitano. You've also got Will Ferrell, John Heder, and Will Arnett. Get enough of these guys together and PJ could make LoTR On Ice!! !